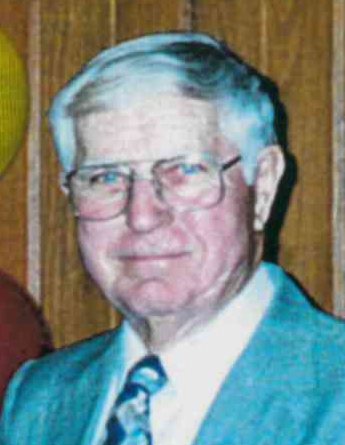 Herbert L. Rhoads, 95, of Clarksville, Indiana, died Thursday, July 5, 2018, at Clark Memorial Hospital in Jeffersonville, Indiana. He was born June 26, 1923, in Harrison County, Indiana, to the late Wylie Herbert and Minnie Elizabeth Frakes Rhoads. He graduated from Corydon High School and the University of Louisville, was retired from CSX Railroad (formerly L&N Railroad), was a farmer, was a member of the Methodist faith and the Sellersburg American Legion Post #204, was a past commander of the V.F.W. Post 2950 in Corydon, and was a U.S. Army veteran of WWII. He was preceded in death by his parents; his wife of 68 years, Beulah M. Curts Rhoads; his son, Dale K. Rhoads; his grandson, Cody Benjamin Rhoads; his brothers, Alonzo, Russell, and Francis Rhoads; and his sisters, Ethelda Orme, Catherine Frakes, Ruth Mathes, and Margie Longacre. Survivors include his grandsons, Jeff Rhoads, Eric Shaughnessy (Stefanie), and Adam Rhoads (Tamara); his great grandchildren, Zachary, Carson and Tessa Rhoads, and Garrett and Liam Shaughnessy; and many loving nieces and nephews. Funeral services will be at 1:00 p.m. Saturday, July 14, 2018, at Beanblossom-Cesar Funeral Home in Corydon. Rev. Andy Hansen will officiate. Burial will be in Perseverance Chapel Cemetery near Corydon. Visitation will be from 5:00 – 7:00 p.m. Friday and after 9:00 a.m. Saturday at the funeral home. The family requests that expressions of sympathy be made to the Perseverance Chapel Cemetery Fund. Pallbearers will be Eric Shaughnessy, and Jeff, Adam, Les, Donn, Michael and Matthew Rhoads.